Broiler breeds are developed for their efficient feed-to-meat development ratio and their early maturing capabilities. These breeds have white or yellow skin and white feathers for a clean finished look desired by commercial markets. Unlike slow growing, hardy and "natural" heritage breeds, the broiler chicken has been genetically altered, and that presents health and hardiness issues for the bird. Do not choose these birds unless you are familiar with their special husbandry needs and are prepared to slaughter at or before four months. Hatcheries provide information concerning these breeds, which are not recommended for backyard or organic keepers. These large and fast-developing birds are the foundation of the commercial industry. Subject to several health and husbandry issues, they are a controversial breed for heritage producers and animal welfare advocates. This breed has a high feed-to-growth ratio and is at slaughter age before eight weeks. It does not reproduce readily and is sold as day-old chicks. The males dress out at 3 to 5 lbs. and the hens around 2 lbs. The birds are stocky and prone to leg weakness and breast blisters -- which are inherited conditions -- if not raised correctly. They have white to yellow skin and white feathering. This white-feathered, large-breasted breed is smaller than the standard broiler. It has fewer health issues and is a more practical breed for the home farmer. Renowned for its gourmet market, the bird dresses at 1 to 2 lbs. and produces delicate meat. Cornish are excellent birds to raise and come in a variety of colors, including brown and red with dark penciling. They are hardy and good foragers. The White Cornish is the variety bred for commercial markets. This breed is white-feathered and similar to the Rock Cornish. It is the better choice for the home farmer because it has not been genetically weakened. The bird is slower to mature and does not develop the weakened legs or other health issues of the commercial Rocks. This breed does require care so it does not gain excessive weight. The Cornish dresses at a mature weight of 8 lbs. and is usually butchered at 11 to 12 weeks. This breed is an acceptable choice for organic production and pasture raising. 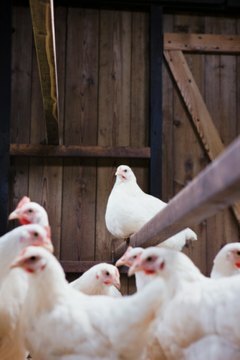 Organic farmers may choose a heritage breed for broiler stock. These "original" stocks were bred on farms and were noted for their beauty, hardiness, egg laying and ability to reproduce naturally (brooding). These slow-growing breeds are disease resistant and do not present with the genetically created health problems of the commercial broilers. Choose from the Wyandottes, White Rock, Turken, Delaware and other antique farm breeds. These birds are the "chicken" of the farm table and have historical and environmental significance. They are the breeds of choice for organic, progressive and "green" directed farms.